John Force backed up his title as the most successful driver in NHRA history Sunday by beating out teammate Robert Hight in the NHRA Nationals Funny Car final at Las Vegas Motor Speedway. 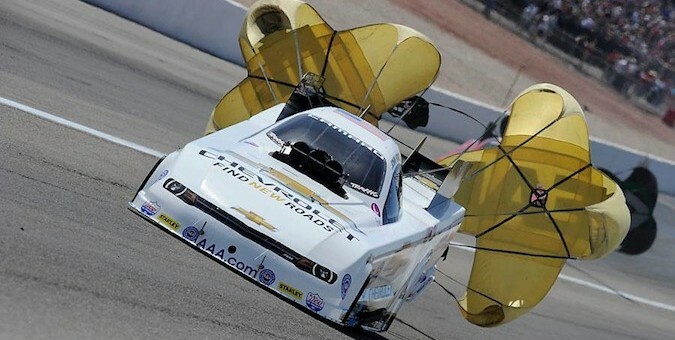 Force, 65, currently sits sixth in the NHRA Mello Yello Series points standings. Force clocked a 4.148-second pass at 312.35 mph in his Chevrolet Camaro for the win, beating out Hight, who ran a 4.154 at 306.05 mph in his Auto Club Camaro. The win was Force’s 142nd of his career and his fifth ever at Las Vegas. Force’s victory Sunday also marked the first win by a Chevy Funny Car since Phoenix 2003. He beat out defending world champion Matt Hagan, Chad Head, and Alexis DeJoria, winner of last year’s NHRA Nationals at Vegas, in earlier rounds before facing off against Hight. The NHRA Mello Yello Drag Racing Series will continue when they head to Royal Purple Raceway on the weekend of April 24-for the O’Reilly Auto Parts NHRA SpringNationals near Houston.